City kid gets a big fish and a big thrill. 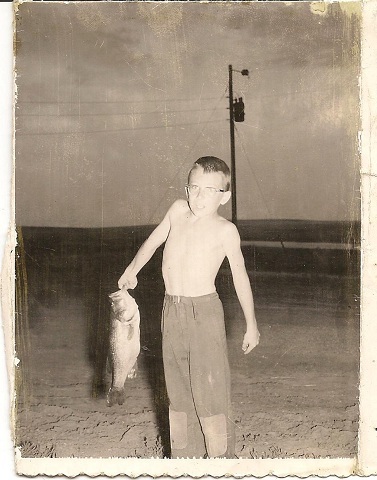 The fish was caught at the Saucerman ranch on Hwy 14 between Hayes and Midland, South Dakota. Taken on an artificial lure. Notice how this 79 pound weakling can barely hold the fish up. The fish weighed almost 5 pounds. Pretty good size fish. The fish was big enough to make small filets. In the spring of the 1930s and 40s, Grandad (John Saucerman) would sometimes catch huge strings of bass weighing up to 8 pounds. The fish were a welcome part of the household food supply.